We liked Barry Davies during his football commentary days, but not everyone did. Most commentators tend to divide opinion but Davies really did seem the ultimate ‘marmite’ broadcaster. In his commentating heyday there were plenty who practically worshipped the man, believing he was the ultimate wordsmith with a great turn of phrase and an air of authority about him. They felt he should get far more big matches than came his way. And at the same time there were some viewers who loathed him, considering him pompous, schoolmasterly and over-critical of what he was watching. His willingness to speak his mind would go down well with his fans, but also lead to at least two England matches arguing with him over comments he made. His disappointment over being continually overlooked for major finals that went the way of John Motson would be totally justifiable in the eyes of his fan club, unnecessarily bitter to the anti-Davies brigade. The high number of other sports he commentated on made him wonderfully versatile in the eyes of admirers, not an out-and-out football man like Motson to the haters. He was a broadcaster who certainly split opinion, but had plenty of fans. “One man’s commentator is another man’s irritation,” he perceptively wrote in his autobiography. But whether one loved or loathed him as a commentator, there was no question that Davies became one of voices of football for decades. He first came to attention with ITV during the 1966 World Cup, before switching to the BBC in 1969 and remaining a football commentator until 2004 (making a one-off return in 2014 to mark Match of the Day’s 50th birthday). By anyone standards that’s a lot of matches and major tournaments, his England commentary years beginning when the likes of Bobby Charlton were still playing and ending after Wayne Rooney had burst onto the scene. The whole ‘Davies v Motson’ saga is one we will come to later, but one area where Bazza could feel of something approaching equal standing to Motty concerned the selection for big England games at major tournaments. For such famous matches as England’s clashes with Argentina at the 1986 World Cup and Germany during Euro ’96, Davies was the man holding the microphone for the BBC. We begin our look back at his England broadcasting career today (such was his longevity that we are splitting this into two parts). Davies would express feelings from an English viewpoint when the side played, as could be told from his “ohh noooooo” reaction when Gareth Southgate had his effort saved in the “penalty competition” – to use a Davies-ism – against Germany in Euro ’96. But Davies was a professional who respected England’s opposition and would give out praise when he felt it was merited. Watching the 1966 World Cup final from the back of the ITV commentary box, he was accused by a colleague of being unpatriotic for telling a West German counterpart he felt they deserved to be level after 90 minutes. When Sweden scored the winner against England at Euro ’92, his instinctive reaction while commentating was to hail the “brilliant goal” rather than focus on the shortcomings of Graham Taylor’s men. 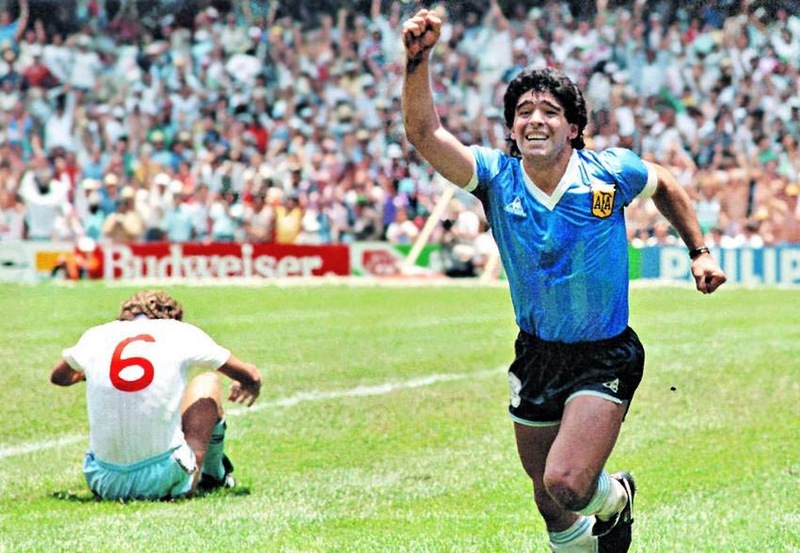 His often-recalled words immediately after Diego Maradona’s second goal against England in 1986 contain no reference to Bobby Robson’s side facing elimination. Seeking further to convey at least some sense of impartiality, he would write in his autobiography that referring to England as “we” or “us” was wrong – despite knowing he was guilty of it during his career – when working for the British Browdcasting Corporation, with plenty of non-English viewers watching. “Getting the right balance between objectivity and looking at the contest through English eyes can be difficult,” he wrote. As mentioned above, Davies quietly watched the 1966 final at Wembley as Hugh Johns commentated for ITV and it would be the closest he would ever come to describing England winning a major tournament. 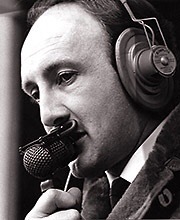 Although behind old hands Kenneth Wolstenholme and David Coleman in the pecking order after moving to the BBC in 1969, Davies was picked to commentate on highlights of England’s friendly win over the Netherlands in November. It began a long relationship between Davies and the national team in his years at the Beeb. The 1970 World Cup would pass without him commentating on England, but he would occasionally cover them in the ensuing years and in October 1973 he was handed a major match – the decisive World Cup qualifier between England and Poland at Wembley. “Win or bust,” Davies correctly stated at the start of his commentary. He was only describing the action for highlights while ITV showed it live, but his commentary would become well-remembered as England unsuccessfully peppered the Polish goal. Then came the sucker punch. “Hunter’s got to make that… and he’s lost it,” Davies accurately called, as Norman Hunter’s infamous mistake let Poland though to take the lead. As the whistle sounded, Davies simply proclaimed: “And England are out of the World Cup.” Two tournaments earlier they had won it, now they wouldn’t even be in the 16-team finals. It was not the last time Davies would say those words in his career. But never again would he commentate on an England World Cup exit that carried with it such disbelief and a feeling of emptiness as that October night. He would be going to the 1974 finals, but England wouldn’t. The 1970s were to be a barren period for England, their continual qualifying failures meaning Davies ended the decade having still yet to commentate on the side at a major tournament. The appointment of Don Revie in 1974 initially brought hope, Davies describing the new manager’s opening 3-0 win over Czechoslovakia. But Revie’s reign would turn increasingly unhappy and problems grew with a home defeat to Wales in May 1977. An unimpressed Davies would express criticism while commentating, his words being taken personally by an under-pressure Revie – a man he had previously worked alongside at the BBC – to such an extent that the manager remonstrated with him when about to be interviewed live after England lost to Scotland four days later. One thing was sure, Davies was not the sort of commentator to hold back for fear of upsetting key contacts. As it transpired Davies would have little to do with Revie after that, as the manager controversially quit just weeks later. Ron Greenwood would take over and easily steer England to the finals of the 1980 European Championship. At last England were back at a major tournament and towards the end of the qualifying campaign optimism built further with the debut display by Glenn Hoddle against Bulgaria. 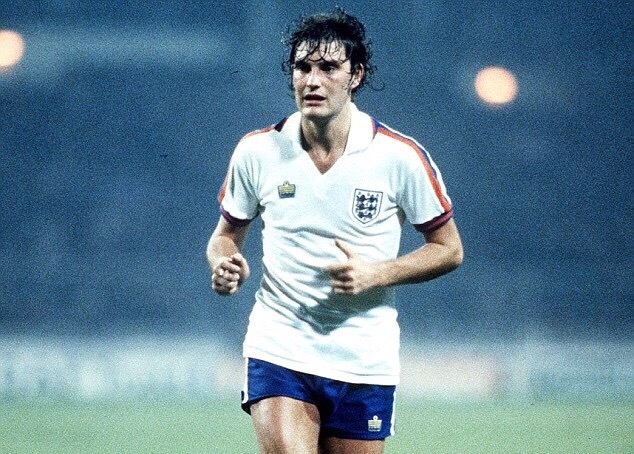 Glenn Hoddle’s England debut attracted words of delight from Barry Davies. Davies was hardly sticking his neck on the line when he predicted on air that Hoddle would be a star of the 1980s, with the flair player delivering again with a cracking volley for England against Spain in March 1981 as Davies commentated. “Oh I say. He’s done it again,” said Davies, joyously. Describing the goal was some compensation for a disappointing 1980 European Championship for Davies, where the only England match he covered was against Spain when the side were already unable to win the tournament. A game against Spain would again be the most significant England match Davies covered at the 1982 World Cup. He was restricted to highlights of the three England games he commentated on – Czechoslovakia and Kuwait were the others – with the Spain match to decide whether England reached the semi-finals. “England come to their own private high noon. A semi-final place is England’s for the taking,” he said as the side entered the field for a game in which they would have to score at least twice. But it wasn’t to be. “The faces of dejection of the England players say it all,” he was left saying after the disappointing goalless draw. At least he was afforded more entertainment when he covered the captivating and controversial semi-final between France and West Germany three nights later. TISWAS or Swap Shop? Duran Duran or Spandau Ballet? Seb Coe or Steve Ovett? Blur or Oasis? FIFA or Pro-Evolution Soccer? In each case, expressing an equal preference was seen as somehow being wrong and they were built up as big rivals. And ‘Davies or Motson?’ would be viewed in exactly the same light. It was a professional rivalry that lasted so long that all the examples listed above coincided or at least overlapped with it. Like Formula One team-mates, Davies and Motson were officially colleagues but unquestionably competing to be top dog. From the moment Motson was controversially picked ahead of the older and more established Davies to cover the 1977 FA Cup final for the BBC, the debate would crop up with alarming frequency. “We are different animals,” Davies has since reflected, with the pair offering contrasting styles that tended to leave viewers preferring one or the other. Both men insist they have always got on well – as further suggested by them being interviewed together for a BBC documentary last year on Euro ’96 – but stop short of making out they have ever been big mates. Each man wanted to get the biggest games. Sadly for Davies, the majority of them fell Motson’s way. 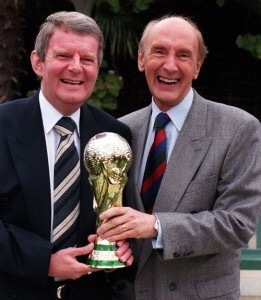 John Motson and Barry Davies hold aloft the World Cup – something England sadly would not do in their many years as BBC colleagues. But while Motson was continually picked for FA Cup, World Cup and European Championship finals (Davies being able to count on one hand such matches that came his way), there was a much greater balance of power on show when it came to England matches – including during major tournaments. This was seen on June 22, 1986, when Davies was commentating live for the BBC on England’s World Cup quarter-final against Argentina. It’s not just retrospectively that this is considered a huge occasion in English football. This was viewed in the build-up as a major match, England up against the side containing the best player in the world in Diego Maradona and knowing they would stand every chance of winning the tournament if they could progress (the fact it was only four years after the Falklands War inevitably added to the hype). If Davies could be entrusted to describe it, then he must have wondered why he didn’t at least occasionally get the FA Cup final; equally, Motson probably felt a bit miffed at not getting matches like this when he was – effectively if not officially – the number one commentator (Motty would instead describe the gripping contest between Brazil and France the day before and was to get the final, so he could hardly feel deprived). Davies had covered England’s nadir during the tournament when he commentated on what few highlights there were in the 0-0 draw against Morocco. “Disaster upon disaster for England,” he said with typical melodrama as Ray Wilkins followed Bryan Robson off the field and the side stared potential elimination in the face. They now had to get a result against Poland to stay in Mexico, with Davies to cover this one too – incredibly his first live England commentary at a major tournament. England started nervously and Davies vented his disgust as the Poles were almost gifted an early goal. “England just cannot afford to make crass errors like that. We’ve got away with it twice – we cannot tempt fate further,” he told viewers. It was as if the side listened to him, Gary Lineker netting a first-half hat-trick to seal victory as co-commentator Jimmy Hill chortled with delight. “Never mind the sunshine and the altitude – it’s raining goals,” was unusually a bit of a corny line for Davies, but it perhaps summed up the jubilant mood as England’s tournament at last got going. There was also a nice nod to the last meeting between the sides 13 years earlier. “Dare we call him the clown?” he quipped as the Polish goalkeeper’s fumble allowed Lineker to complete his hat-trick. Six years earlier Davies had commentated when the English public was afforded its first real glimpse of Diego Maradona, when he almost scored a superb solo goal as England beat Argentina 3-1 at Wembley. Now Davies was seeing the sides meet again, with the player’s two much-talked about goals at the Azteca Stadium presenting Davies with a commentator’s nightmare for the first, the chance to wax lyrical over the second. We know what’s coming when we see the ‘Hand of God’ goal now, but at the time it took everyone by surprise – so unprecedented was it to English eyes. Davies, like the officials, would not spot it and believed Maradona had headed it in. Spotting the England players protesting, he would jump to the wrong conclusion. “They’re appealing for offside,” he told millions of viewers. He acknowledged in his autobiography that he got it wrong, first mentioning during the broadcast it may have been handball when told by his producer as replays – which Davies could not see – were being played of the goal. Diego Maradona celebrates scoring one of the most famous goals described by Barry Davies. But if Maradona’s first goal created a major headache for the commentator, his second would be a delight to describe for any wordsmith. “You have to say that’s magnificent,” was the memorable conclusion as the mesmerising run ended with the ball in the back of the net. “There is no debate about that goal. That was just pure football genius,” he added, emphasising the contrast between the two strikes. Later in the game England brought Barnes on and he helped revive the side’s hopes as he set up Lineker to score. In the dying moments he looked to repeat the move as the ball came out to him out wide. “Every Englishman will surely be saying ‘go on, run at them’,” Davies said as Barnes duly beat his man and whipped over a superb cross towards Lineker. Davies had seen enough football over the years to instinctively know when a chance would surely go in. “Yessss,” he cried, only to almost immediately correct himself as the ball was somehow kept out. It was the last real chance and soon enough Davies would be repeating those painful words from October 1973: “And England are out of the World Cup.” Davies, like England, headed home from Mexico a few days earlier than he would have liked as Motson did the BBC’s live semi-final and then the final. But when people in England talk about Mexico ’86, two matches Davies commentated on involving Bobby Robson’s men tend to stand out. In the next part of our reflections we will recall such dramatic matches covered by Davies as the Italia ’90 quarter-final against Cameroon and the semi-final of Euro ’96 against Germany.